Pro Arts Jersey City is expanding its presence outside of Jersey City with What’s Next? a Pro Arts member exhibition travelling to The Gallery Space (formerly known as Arts Guild New Jersey) located at 1670 Irving Street, Rahway, NJ. The Exhibition will be on view from January 7-30, 2018. Public Reception is on Sunday, January 7, 2018, 1-4 pm. Right now, from American politics to Pyongyang, a lot of things are up in the air. How do artists respond to the world they see ahead of them? The member’s exhibition, What’s Next?, talks about what’s next for the artists and where is their work taking them. Around 35 artist members have expressed their direction for the next level. The members exhibition has been curated by Mollie Thonneson and Deirdre Kennedy. Exhibiting artists: Aliza Augustine, Francesca Azzara, Amy Becker, Olga Bautista, Aileen Bassis, Anthony E. Boone, Susan Carolonza Chanin, Santiago Cohen, Lisa Collodoro, Dorie Dahlberg, Tim Daly, Michael Endy, Andrea Epstein, Hao Feng, Jim Fischer, Tharanga Goonetilleke, Cheryl Gross, Ann Hjelle, Deirdre Kennedy, E. Jan Kounitz, Greg Letson, Beatrice M Mady, Charlann Meluso, Alpana Mittal, Ibou Ndoye, Liz Cohen/Nyode, Christy O’Connor, Jean-Paul Picard, Robyn Prezioso, Daryl-Ann Saunders, Linda Streicher, Rebecca Feranec Sullivan, Mollie Thonneson, Elizabeth Tokoly and Alan Walker. 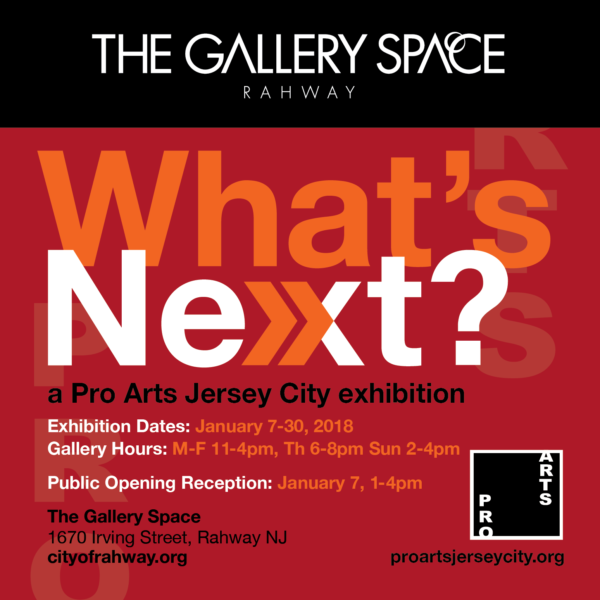 The Gallery Space is a non-profit center for the arts located in the Downtown Arts District of the City of Rahway. Their mission is to present high-level arts programs for the benefit of residents in Central and Northern New Jersey. These programs are made possible by funding from corporations, foundations, government sources, and individual contributions. What’s Next? was first on view at Harborside Atrium, Jersey City during the Jersey City Art and Studio tour 2017. The exhibition is Free and open to public. Viewing Hours: Monday-Friday 11 am-4pm, Thursday 6 pm -8 pm and Sunday 2 pm – 4 pm. For additional information please visit www.proartsjerseycity.org, www.cityofrahway.org or email us at contact.proarts@gmail.com. Pro Arts Jersey City is an organization of professionals in the visual arts, mainly from Jersey City and the surrounding metropolitan area, who are working to promote the arts and to better communicate Jersey City’s identity as a growing arts center. Please visit our website www.proartsjerseycity.org or call 201-771-2781 for more information. This program is made possible in part by funds from the New Jersey State Council on the Arts/Department of State, a partner agency for the National Endowment for the Arts and by funds from the National Endowment for the Arts, administered by the Hudson County Office of Cultural & Heritage Affairs, Thomas A. DeGise, County Executive, and the Board of Chosen Freeholders.